Islamorada (United States) (AFP) - Clad in a gray hooded wetsuit, Eric Billips straps on his scuba tank, grabs a pole spear and nods at his dive buddy as they step feet-first off the boat and disappear with a splash into sparkling blue waters off the Florida Keys. The lionfish hunt is on. 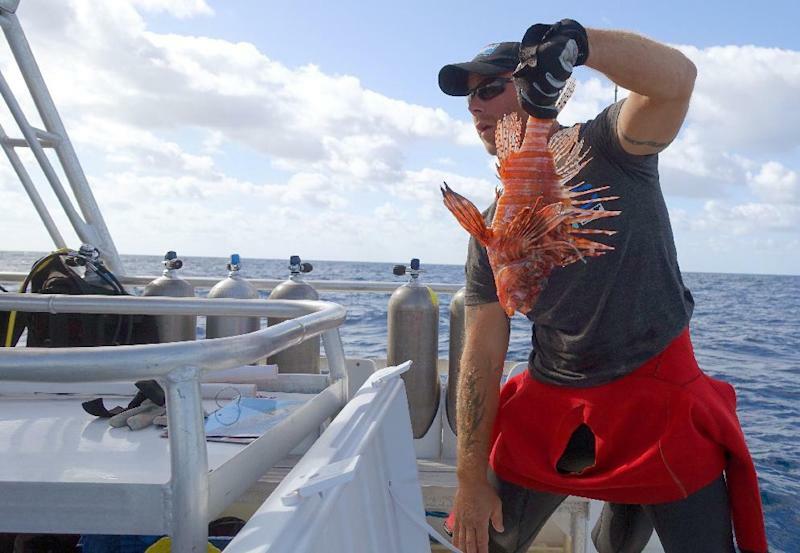 Billips, 42, speared his first lionfish six years ago and estimates he has since killed thousands of the invasive, venomous predators, as their numbers have exploded across the western Atlantic and Caribbean. But he isn't sure what he will find in this particular spot, about four and a half miles (seven kilometers) offshore. A fisherman told him he'd snared a couple of lionfish on his hook and line there -- which was unusual because they typically stalk their prey in the ocean depths and don't chase bait on a line -- and gave Billips the coordinates so he could find the area himself. The divers descend 135 feet (about 40 meters), and see what looks like bridge debris -- concrete and steel girders that someone dropped there long ago to create shelter and habitat for fish, and a custom fishing hole. Full-grown grouper and snapper are swimming around, along with vast schools of minnows ready to be gobbled up by the lurking lionfish. Billips kneels in the sand and begins to shoot. His weapon is equipped with a three-pronged trident tip that impales each lionfish. He pushes the speared fish into his shoulder-slung container -- a narrow barrel with a one-way entry -- and pulls the tip out, clean and ready to shoot again. Twelve minutes later, Billips and his fellow diver resurface, grinning and breathless. 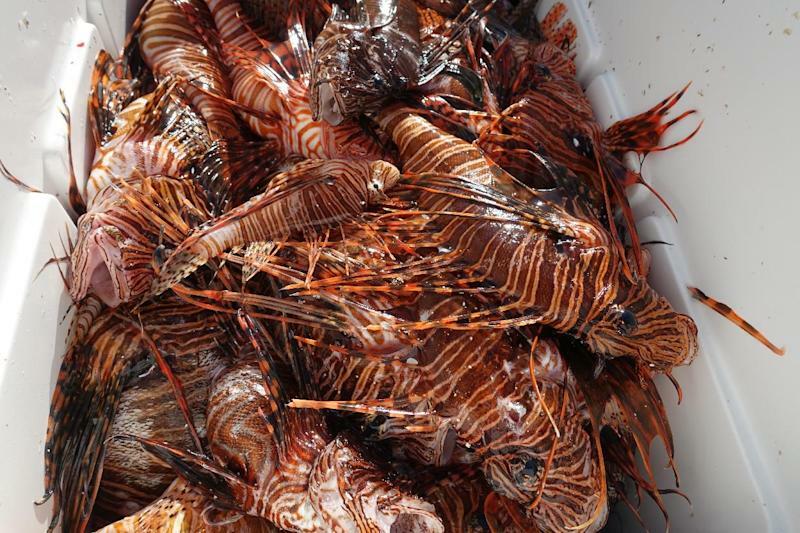 They slide their containers onto the boat, each filled with more than a dozen fat, full-grown lionfish. "It's crazy. These lionfish, they have no fear," says Billips, who owns the Islamorada Dive Center in the Florida Keys. Two more divers go down to hunt, and soon they emerge with their own bounties. A cooler fills up with twitching red, orange and brown striped fish, some as long as 16 inches (40 centimeters). Billips pauses for a quick review of the cooler contents, and counts about 50. Then he fires up the boat's engine to bring his team to the next fishing spot. Lionfish were first spotted off Dania Beach, Florida, in 1985. The fish are native to the Red Sea and the tropical Pacific, and are believed to have been introduced to the western Atlantic by people who let their aquarium fish go in the ocean. Two species of lionfish -- Pterois volitans, which is the most common, and Pterois miles -- have officially become the first outsider finfish to establish a sizeable population in the waters off the United States. They can now be found in an area covering more than 1.5 million square miles (four million square kilometers) in the western Atlantic, Caribbean and Gulf of Mexico. With 18 venomous spikes that can cause intense pain, and no natural enemies besides humans, these members of the scorpionfish family scare off any would-be predators. Even sharks will not eat them. But lionfish will eat almost anything smaller than them, including valuable species like red porgy, vermilion snapper, Nassau grouper and fish that consume algae off reefs and keep them healthy. "It is quite alarming that a small population of lionfish can literally consume millions of prey over the course of the year, so that is one of the reasons we are very focused on control," says James Morris, a leading lionfish researcher at the National Oceanic and Atmospheric Administration (NOAA). The first lionfish derby was held in 2009 in the Bahamas, according to Lad Akins, director of special projects at Reef Environmental Education Foundation (REEF), a non-profit marine conservation group. "Derbies have spread all through the region and they are held quite frequently now," he says. What has given divers hope that their efforts are working is an ongoing study being led by Stephanie Green, a marine ecologist at Oregon State University. Her team has found that killing between 75 and 95 percent of lionfish off reefs in the Bahamas was enough to help populations of local fish rebound. For the past couple of years, Green has been traveling to South Florida, tracking derbies, counting lionfish in the waters before and after hunting expeditions, and comparing the populations to areas that have not been hunted. She and colleagues are submitting their latest work for peer-review and publication in the coming months. So far, the news is good. "We are finding really strong evidence that volunteers can be really effective," Green says. "By doing derbies on an annual basis, or possibly even more frequently, the hope is that you are keeping lionfish at very low numbers, low enough that they are not having an impact." After the derby off the Florida Keys, a seaside party ensues. Reggae music plays, and prizes of cash, stuffed toy lionfish and jars of liquor are handed out to the winners. Akins, who has co-authored a lionfish cookbook, demonstrates for a small crowd how to clean the fish, cut off the spikes, and slice filets. Volunteer chefs make samples of ceviche and fried lionfish for the crowd. "It is a really light, flaky fish," says Michelle Dickerson, a diver from Texas. "It tasted really good." Two of the five boats that entered this derby came back empty handed. 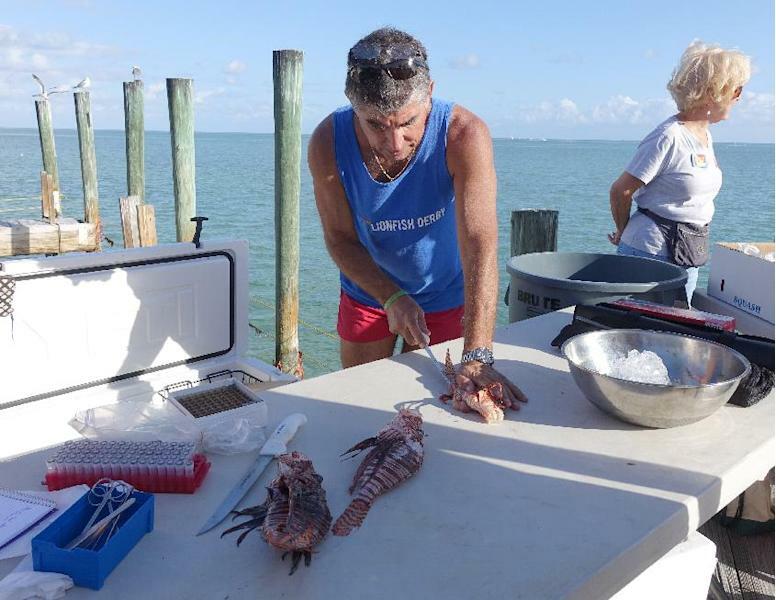 One team caught just two lionfish, and another boat snared 11. Billips' boat, The Life Aquatic, is the winner with 86. For Billips, it wasn't the biggest haul ever, but it was still satisfying. "That probably saved 20,000 little fishies, just our boat today," he says.